The House of Representatives decides if there is sufficient evidence to warrant a Senate trial. The House votes impeachment - the Senate tries the case. Similar to an indictment in a criminal case, impeachment is an accusation of wrongdoing. Any civil officer of the United States may be impeached. Removal from office occurs only after a conviction by the Senate. 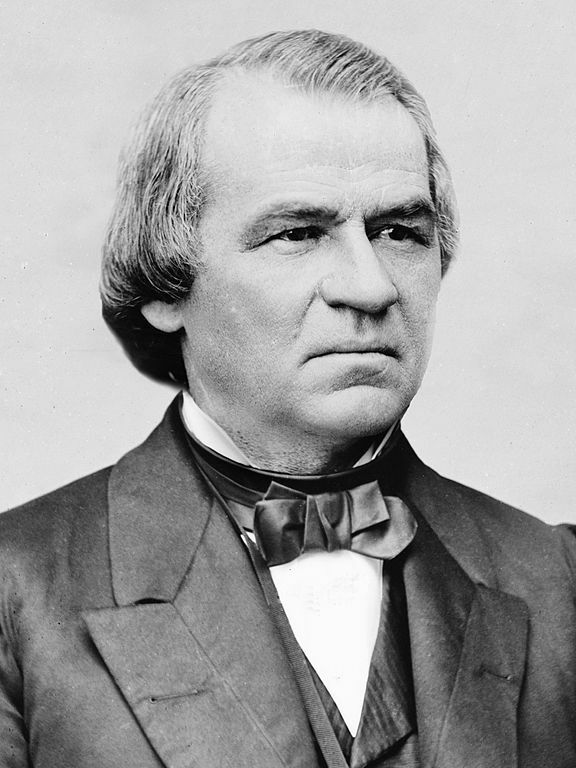 The Impeachment of Andrew Johnson, 17th President of the United States, was one of the most dramatic events in the political life of the United States during Reconstruction, and the first impeachment in history of a sitting United States president. The Impeachment was the consummation of a lengthy political battle, between the moderate Johnson and the "Radical Republican" movement that dominated Congress and sought control of Reconstruction policies. Johnson was impeached on February 24, 1868 in the U.S. House of Representatives on eleven articles of impeachment detailing his "high crimes and misdemeanors", in accordance with Article Two of the United States Constitution. The House's primary charge against Johnson was with violation of the Tenure of Office Act, passed by Congress the previous year. Specifically, he had removed Edwin M. Stanton, the Secretary of War (whom the Tenure of Office Act was largely designed to protect), from office and replaced him with Major General Lorenzo Thomas. The House agreed to the articles of impeachment on March 2, 1868. The trial began three days later in the Senate, with Supreme Court Chief Justice Salmon P. Chase presiding. Trial concluded on May 26 with Johnson's acquittal, the votes for conviction being one less than the required two-thirds tally. Senator David Trotter Patterson, son-in-law to President Johnson, believed that his father-in-law was "not guilty and that the charges against him were contrived." Patterson's vote was the difference between guilty and acquittal. The impeachment and subsequent trial gained a historical reputation as an act of political expedience, rather than necessity, based on Johnson's defiance of an unconstitutional piece of legislation and with little regard for the will of the public (which, despite the unpopularity of Johnson, opposed the impeachment). Until the impeachment of Bill Clinton 131 years later, it was the only presidential impeachment in the history of the United States. See also President Andrew Johnson: History Homepage. On February 24, three days after Johnson's dismissal of Stanton, the House of Representatives voted 126 to 47 in favor of a resolution to impeach the President of high crimes and misdemeanors. The two sponsors of the resolution, Thaddeus Stevens and John A. Bingham were immediately dispatched to inform the Senate that the House had officially voted for impeachment. 1.Dismissing Edwin Stanton from office after the Senate had voted not to concur with his dismissal and had ordered him reinstated. 2.Appointing Thomas Secretary of War ad interim despite the lack of vacancy in the office, since the dismissal of Stanton had been invalid. 3.Appointing Thomas without the required advice and consent of the Senate. 4.Conspiring, with Thomas and "other persons to the House of Representatives unknown," to unlawfully prevent Stanton from continuing in office. 5.Conspiring to unlawfully curtail faithful execution of the Tenure of Office Act. 6.Conspiring to "seize, take, and possess the property of the United States in the Department of War." 7.Conspiring to "seize, take, and possess the property of the United States in the Department of War" with specific intent to violate the Tenure of Office Act. 8.Issuing to Thomas the authority of the office of Secretary of War with unlawful intent to "control the disbursements of the moneys appropriated for the military service and for the Department of War." 9.Issuing to Major General William H. Emory orders with unlawful intent to violate the Tenure of Office Act. 10.Making three speeches with intent to show disrespect for the Congress among the citizens of the United States. The eleventh article was a summation of the first ten. To fulfill promises made during the impeachment trial, Johnson nominated John M. Schofield as War Secretary, who was confirmed. Stanberry resigned and Johnson replaced him with William M. Evarts as Attorney General. He maintained his opposition to the Reconstruction Acts and continued to veto bills seeking to admit seceded states under their provisions, and Congress continued to override his vetoes. Johnson persisted in his perceived role as protector of the white race. The President had measurable support to run for a full term and he was amenable to the idea. At the Democratic Convention, when he came in second on the first ballot and faded from there, it became clear that he was too unpopular to run. Horatio Seymour received the Democratic presidential nomination, which Johnson silently endorsed. One of Johnson's last significant acts as President was to grant unconditional amnesty to all Confederates on Christmas Day 1868, after the election of Ulysses S. Grant but before he took office in March 1869. Earlier amnesties, requiring signed oaths and excluding certain classes of people, had been issued by Lincoln and by Johnson. From Library Journal: Known for his Carl Schurz: A Biography (LJ 2/15/82), Trefousse delivers the first Johnson study in years, a definitive assessment of his career and presidency. Johnson's papers and other sources reveal his fatal idealization of the agrarian utopia, his fierce advocacy of strict Constitutional constructionism, and his imprudent insistence upon the Republican Party’s adoption of his views on race. Trefousse demonstrates that Johnson, because of his upbringing, was out of step with the great changes emerging at the end of the Civil War. His stubborn attachment to his increasingly archaic views was responsible for his political and military success, but also for his impeachment. A brilliant, compassionate portrait of a dynamic era of social change and national healing, and of the tragic failure of an American leader. Not to be missed. --Susan E. Parker, Harvard Law Sch. Library. About the Author: Hans L. Trefousse is professor of history at Brooklyn College and the Graduate Center of the City University of New York. His other books include The Radical Republicans, a path breaking history of Reconstruction. He breaks with those historians who have suggested that Johnson followed what would have been Lincoln's path to reconstruct the South, as he discusses the complex impeachment proceedings against Johnson and the effectiveness of the impeachment process in calming political tensions, if not in removing Presidents from office. Readers who wish to broaden their understanding of Lincoln in this anniversary year will do well to select this well-researched work even if their collection already includes such examinations as Howard Mean's narrower The Avenger Takes His Place: Andrew Johnson and the 45 Days That Changed the Nation.—Theresa McDevitt, Indiana Univ. of Pennsylvania Library. From Publishers Weekly: Fresh from his masterful The Summer of 1787, Stewart takes on one of the seamiest events in American history: the vengeful impeachment of Lincoln's successor as president; the Senate failed to convict Andrew Johnson by a single vote. At issue was the continuation of Lincoln's plans to reintegrate the South into the union after the Civil War. But also at stake, as always, was party politics. Stewart takes readers through a tangled web of motives and maneuverings in lively, unadorned prose. He's skilled at characterizing his large cast of characters and, as a lawyer, has a practiced nose for skullduggery, of which there was much. Corruption deeply marred the entire impeachment effort. Justifiably, Stewart holds his nose about most of the people involved and admires few of them. As he sums it up, in 1868 none of the country's leaders was great, a few were good, all were angry, and far too many were despicable. Stewart offers little analysis and advances no new ideas about what he relates, but he tells the story as well as it's ever been told. Black and white photos. Edwin M. Stanton, Thaddeus Stevens and Benjamin F. Butler were the three most suspicious of the President and would usually meet with each other along with other Radicals at Stanton's office or Stevens' home to plan Johnson's impeachment. Table of Contents: Publisher's Preface; Preface; The Problem Of Reconstruction; The Baltimore Convention; Mr. Johnson's Accession To The Presidency; First Attempt To Impeach The President; The Tenure-of-office Act; Impeachment Agreed To By The House; Impeachment Reported To The Senate; Organization Of The Court Argument Of Counsel; Examination Of Witnesses And Their Testimony; A Conference Held And The First Vote Taken; The Impeachers In A Maze. A Recess Ordered; Was It A Partisan Prosecution? ; The Constitutional Power Of Impeachment; Supplement. Johnson faced a nearly impossible task—to succeed America’s greatest chief executive, to bind the nation’s wounds after the Civil War, and to work with a Congress controlled by the so-called Radical Republicans. Annette Gordon-Reed, one of America’s leading historians of slavery, shows how ill-suited Johnson was for this daunting task. His vision of reconciliation abandoned the millions of former slaves (for whom he felt undisguised contempt) and antagonized congressional leaders, who tried to limit his powers and eventually impeached him. The climax of Johnson’s presidency was his trial in the Senate and his acquittal by a single vote, which Gordon-Reed recounts with drama and palpable tension. Despite his victory, Johnson’s term in office was a crucial missed opportunity; he failed the country at a pivotal moment, leaving America with problems that we are still trying to solve. About the Author: Annette Gordon-Reed is a professor of law at New York Law School, where she has taught since 1992. She is the author of the celebrated Thomas Jefferson and Sally Hemings: An American Controversy, co-author with Vernon Jordan of Vernon Can Read!, and editor of Race on Trial: Law and Justice in American History. She lives in New York City. Johnson has always been an enigma: much is known about what he did, little about why he did it. He wrote few letters, kept no diary, and rarely confided in anyone. Most historians either admire or despise him, depending on whether they consider his Reconstruction policies right or wrong. Castel achieves an objective reassessment of Johnson and his presidential actions by examining him primarily in terms of his effectiveness in using power and by not judging him--as most other scholars have--on moralistic or ideological grounds. The book begins with an overview of America at the end of the Civil War and a description of Johnson's political career prior to 1865. Castel recounts the drama of Johnson's sudden inheritance of the presidency upon Lincoln's death and then examines how Johnson organized and operated his administration. Johnson's formulation of a Reconstruction policy for the defeated South comes under special scrutiny; Castel evaluates Johnson's motives for that policy, its implementation, and its reception in both North and South. He descries and analyzes Johnson's quarrel with the Republican dominated Congress over Reconstruction, the triumph of the Republicans in the election of 1866, the president's frustrated attempt to remove Secretary of War Edwin M. Stanton from office, his bitter dispute with General Ulysses S. Grant, and his impeachment by Congress. Johnson's impeachment trial is covered in detail; Castel explains how it was that Johnson escaped conviction and removal from office by the narrowest possible margin. The book concludes with a discussion of Johnson's place in history as judged by scholars during the past one hundred years. This study sheds light on the nation's problems during the chaotic period between 1865 and 1869 and contributes a great deal to a much improved understanding of the seventeenth president. This book is part of the American Presidency Series. In addition, The First Ladies Fact Book surpasses typical references, featuring selections of the most intimate correspondence of each first lady, from letters to their families to letters to their presidential husbands. Delightful surprises abound, including little-known information about the women’s hobbies, style of dress, habits of socializing, and peculiarities. The more than 700 evocative photographs include sixteen pages of color photography of first-lady fashion, making it a wonderful combination of solid reference and eye catching visual history. But the process isn't easy: not every one of the 13 colonies-turned-states is ready to incur the wrath of England, and behind-the-scenes negotiations prove as much a part of 18th century congressional sessions as they do today. Besides this peek into a less-romanticized version of the past, John Adams is also a story of the man himself. Adams' frustration at being forgotten or overlooked at critical junctures of America's early development--sent abroad for years instead of helping to draft the U.S. constitution--is detailed. So is his dismay that the truth of what actually transpired leading to the signing of the Declaration of Independence has been slowly forgotten and replaced by a rosier myth. But above all, John Adams is the story of two key ties: Adams' 54-year marriage to Abigail Adams (Laura Linney), every bit her husband's intellectual equal and anchor, and his difficult, almost symbiotic relationship with Thomas Jefferson (Stephen Dillane) over decades. Giamatti, of course, has to carry much of the drama, and if he doesn't always seem quite believable in the series' first half, he becomes increasingly excellent at the point where an aging Adams becomes bitter over his place in history. Linney is marvelous, as is Dillane, Sarah Polley as daughter Nabby, Danny Huston as cousin Samuel Adams, and above all Tom Wilkinson as a complex but indispensable Ben Franklin.